The Internet of Things (IoT) is shaping our day-to-day lives – it is estimated that thirty billion devices are expected to be connected to the internet in 2020. Moreover, cloud-based applications are changing today’s enterprise landscape, from the products manufactured and the services offered to the way enterprise employees interact with each other, or with customers and partners. In fact, enterprise applications are doubling every 2.5 years, and global cloud traffic is expected to increase almost fourfold between 2015 and 2020. As the cloud relies heavily on data centers, annual global data center Internet Protocol (IP) traffic (data center to data center traffic, also known as east-west), is expected to reach 15.3 zettabytes (ZB) by 2020, up from 4.7 ZB in 2015. The fast-paced proliferation of internet-connected devices and the paradigm shift to cloud-based applications are fueling major disruption and redefining how the underlying networks are architected, operated and evolved. The evolution of optical transport networks from asynchronous and proprietary (e.g., asynchronous transfer mode [ATM], token ring, or Fiber Distributed Data Interface [FDDI]) to synchronous and standards-based (e.g., Synchronous Optical Network [SONET]/Synchronous Digital Hierarchy [SDH]) in the early 1990s has changed the telecommunication landscape forever. Predefined frame rates, containers and multiplexing hierarchy unlocked interoperability between different carriers’ networks and allowed the extension of optical transport networks to reach all four corners of the world. Voice protocols (telephone calls) comprised the majority of traffic carried across the network, with fixed bit rate (typically, 64 kilobits per second) and predetermined (or predictable) traffic patterns. Simultaneously, Ethernet has evolved in data rates, as well as traffic engineering and management capabilities, to provide a ubiquitous, simple and cost-effective way for data networking over ATM, Token Ring, FDDI, etc. 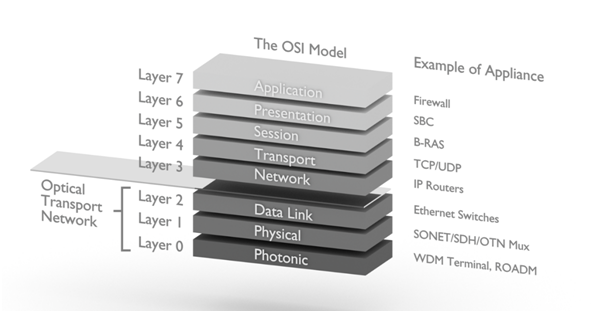 Accompanying this evolution, a seven-layer networking model – called the Open Systems Interconnection (OSI) model, introduced in the mid-1980s – was the reference architecture to which the different types of optical terminals were designed and built, as depicted in Figure 1. A “Layer 0” has been added to the model to reflect the advancements of wavelength-division multiplexing (WDM) and its new wavelength-based routing and switching capabilities. Later on, the concept of “Layer 2.5” was added to reflect multi-protocol label switching (MPLS) and virtual local area network (VLAN) technologies. In the late 1990s and early 2000s, the optical networking industry witnessed numerous technology breakthroughs in hardware and software that led to the creation of a new breed of optical platforms. This generation offers networking capabilities in adjacent layers to further maximize return on investment and simplify network operations (Figure 2). This was the birth of a still-evolving new type of optical equipment called packet-optical transport systems (P-OTS). The arrival of P-OTS spotlights how the lines are becoming blurred between the different layers in the OSI model. The proliferation of the internet and the paradigm shift in broadband access and optical networking have fueled the creation of many online content providers spanning industries, such as up-to-the-minute news, social media sites, streaming movies and music libraries, online retailers and many more. Most internet content providers’ (ICPs’) revenue streams are from online advertisements and monthly or yearly subscriptions for content access such as movie or music streaming. Therefore, ensuring that end users have constant access to content is crucial for every ICP’s business model. As a result, ICPs tend to spend heavily on their networks, particularly on data centers and cloud infrastructure. It is no surprise that the share of capital expenditures (CapEx) is increasingly coming from major ICPs. The rise of the ICPs added a new type of player to the telecommunication landscape. With hundreds of millions of end users - even billions of end users for some ICPs – spread all over the globe, an unheard-of demand for scalability and traffic growth, and significant revenue streams directly related to end users’ quality of experience, ICPs have become a major driving force for new equipment attributes with unprecedented levels of network performance, automation and programmability. With an ICP business model in which content is king and must be accessible anywhere, anytime and on any device with the highest level of quality, it became clear to the telecommunication industry that the 1980s-era OSI model architecture underpinning the delivery of this content has reached a tipping point. It no longer supports the constant evolution in networks (e.g. network functions virtualization [NFV], software-defined networking [SDN], etc. ), nor the new service delivery model based on cloud applications, service virtualization, etc. Its heritage of function- and layer-specific network appliances, closed and proprietary protocols, rigid networking capabilities and high operational costs sparked the urgent need to evolve toward simpler, more efficient and agile architectural model to underpin the accelerated adoption of cloud-based networking. The new model consolidates and simplifies cloud service delivery and networking into two layers where all networking layers (Layer 3 and below) are represented by the transport layer, while all application layers (Layer 4 and above) are grouped under the cloud services layer. The transport layer contains the transport functions from Layer 0 (photonic) to Layer 2.5 (packet switching), or even to Layer 3, offering “packet-aware” transport capabilities. This layer sets the guidelines and principles for the transport of data streams, whether between end users and data centers or between data centers with bursty and often unpredictable traffic patterns. The transport layer also defines the features and capabilities that increase network agility and performance and sets the cost points for new benchmarks in service delivery and cost-effectiveness, all key ingredients to the successful deployment of any cloud application. Moreover, the transport layer is the cradle of numerous open concepts and projects (e.g. Telecom Infrastructure Project [TIP], etc.) aimed to ensure seamless interoperability between networking equipment vendors across the lower layers in the OSI model. The transport layer’s support of open networking helps network operators smoothly transition and evolve their existing infrastructure to the cloud with ease and efficiency. It elevates network infrastructure from rigid and dedicated to shared and highly virtualized, thus allowing network operators to maximize the utilization of existing assets and defer premature Capex-heavy network overbuilds. The cloud services layer contains all applications, functions and services that run in the cloud, including consumer and business applications, virtualized network functions (VNF), SDN-based service creation and orchestration tools, software frameworks and applications for big data and machine learning. The rise of ICPs and their business model, where content must be delivered to hundreds of millions of users across the globe with the highest levels of quality, has fueled the creation and development of numerous breakthroughs in defining protocols and building smart software tools. This enables large-scale task automation and programmability to streamline operations, eliminate the sources of human errors and reduce operating costs. The massive demand for connectivity driven by the IoT and cloud-based consumer and business applications is evolving toward a model in which real-time network decisions are made autonomously (cognitive networking) over highly-virtualized hardware and software resources. The new model also defines an efficient communication and information sharing channel between the two layers through open and standards-based applications programming interfaces (APIs) such as RESTCONF, NETCONF/YANG and gRPC. These APIs ensure an efficient and bidirectional information flow between the two layers to turn the network (transport layer) into a dynamic pool of resources for service requests triggered from the upper layer (cloud layer). This dynamic interworking model provides all the building blocks and mechanics to enable network-wide task automation, proactive network monitoring, dynamic bandwidth allocation and much more, as depicted in Figure 3. High capacity and seamless scalability: Technology breakthroughs in optical transport networking, such as super-channels, integrated photonics and advanced modulation schemes, unlock the ability to transport massive capacity over unprecedented distances to underpin the continuous demand for bandwidth and meet the stringent requirements of bandwidth-hungry, high-performance cloud applications. Transport networks must be scalable to meet future growth without network interruption or a massive infusion of capital. High level of efficiency and cost-effectiveness: While the network is key for the successful operations of all cloud providers, it represents a cost center where operational expenditures can be lowered by choosing equipment that offers low power consumption, reduced footprint and low cost per transported bit. High level of task automation: To deal with massive data streams and bursty, often unpredictable traffic patterns between end users and data centers or between data centers, cloud providers can leverage smart software tools to automate recurring tasks, enhance service management and streamline operations. Emerging technologies like software-defined capacity (SDC) offer service providers a network model with pay-as-you-deploy bandwidth, flexible bandwidth pools and movable bandwidth across the infrastructure to instantly respond to forecasted and unforeseen events. They can also take advantage of new types of operational procedures centered around easy installation (e.g. installation in minutes), provisioning (e.g. zero-touch provisioning), streaming telemetry and proactive maintenance. Support of open concepts/frameworks: Many cloud providers value openness and seamless interoperability between networking equipment vendors across layers. In fact, numerous cloud providers are founding members of open concept projects and initiatives such as the Open Compute Project (OCP), TIP and many others. Hence, optical transport networks must support open networking concepts to help smoothly transition and evolve existing networking infrastructure to the cloud with ease and efficiency. The cloud and IoT are redefining how networks are architected, operated and evolved. The fast-paced proliferation of internet-connected devices and the paradigm shift to cloud-based applications are driving an architectural evolution toward a new model based on a transport layer and a cloud services layer. In order to better adapt to this new era of hyper-connectivity and web-scale, an intelligent transport layer leverages the latest technology breakthroughs to reach an unprecedented level of scalability, efficiency and automation. 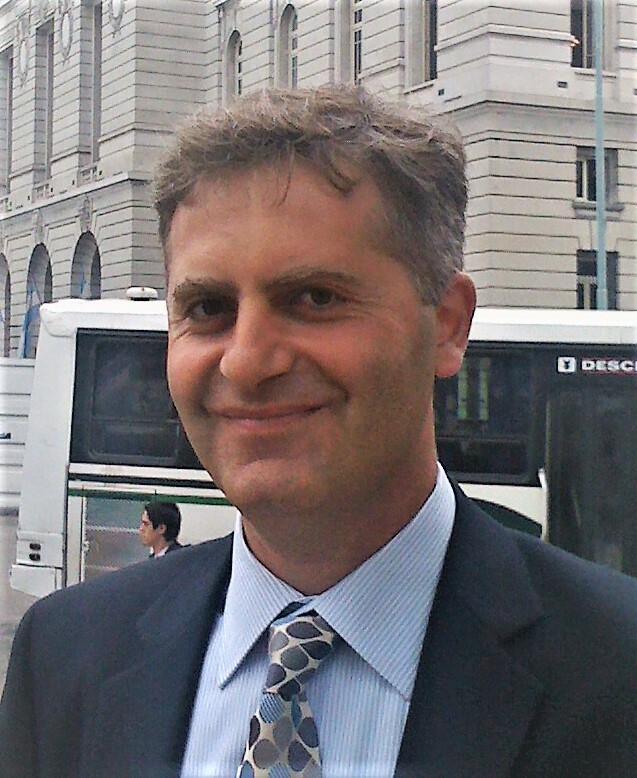 Fady Masoud is a Principal Products and Technical Marketing at Infinera. He brings over 20 years of expertise and insights on the architecture and the evolution of optical networks. Prior to joining Infinera, Fady held various positions in the optical domain at Nortel and then Ciena including test engineering (first 10Gbps systems), network engineering, prime for data center interconnect and many others. He is the author of many publications, including books, on the architecture and the evolution of next generation optical networks. Fady holds a Bachelor’s degree in Electrical Engineering from Laval University (Quebec City, Canada) and a Master’s degree in Engineering (network simulation) from the superior school of technology (Montreal, Canada).